Use the mouse to move the camera click for power and again to shoot. Are you the best crazy golfer around? 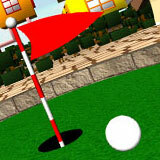 Cube world will really test your crazy putt skills along 10 epic courses. Can you complete them all under par or even at all? With limited shots, you're really in for a challenge!